MANHATTAN (CN) – Claiming that her father’s lawsuit gutted the auction of a Basquiat masterpiece, the middle daughter in a family of art collectors brought a $100 million legal demand of her own Thursday in the latest swat of an ugly family dispute. “Flesh and Spirit” sold for $30.7 million at Sotheby’s last month — a hair above the auction house’s asking price — but Belinda Neumann-Donnelly claims the piece could have fetched as much as $45 million had her father, Hubert, not brought a lawsuit that asserted rights to the work. Like her father, Belinda brought her suit in Manhattan Supreme Court. Represented by Columbus Circle attorney Judd Burstein, Belinda says her father never had the right to sell any artworks in what he called the “Neumann Family Art Collection,” which Belinda denies even exists. “For many years, [Hubert] has been fraudulently buying and selling art owned by a trust for which he had no authority to act,” the complaint states. 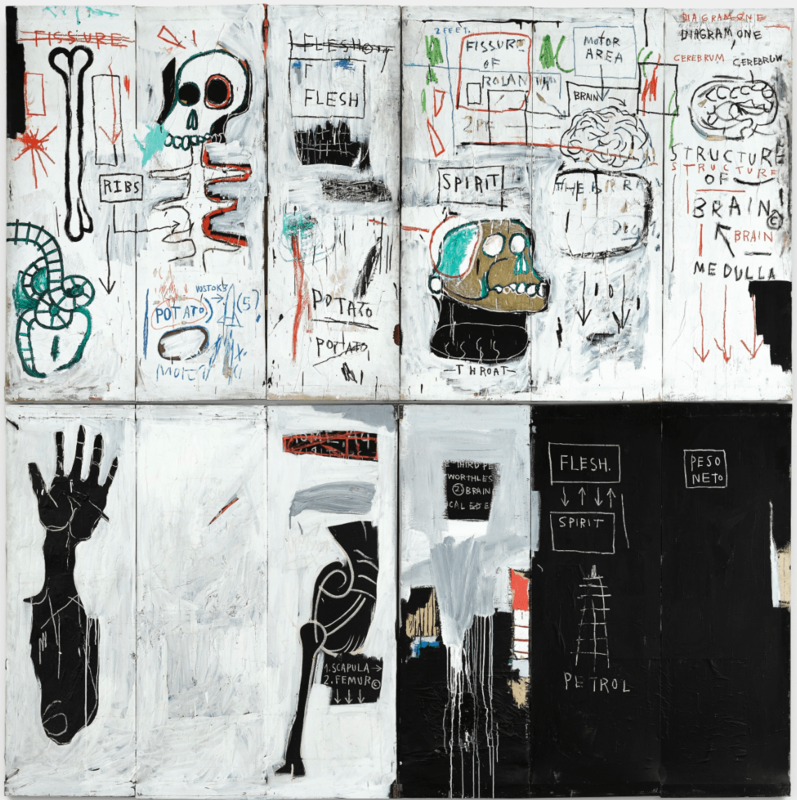 As for “Flesh and Spirit” specifically, Belinda contends that her mother, Dolores Neumann, bought the painting from Jean-Michel Basquiat directly in 1983 with money from her parents. Dolores retained sole ownership of the painting until her death, according to Belinda’s complaint, which says the right then fell to Belinda her as preliminary executrix of the estate after Dolores wrote Hubert out of her will. Four days after Hubert filed suit, a claims court judge found that Hubert “ha[d] absolutely no right or even interest in” the Basquiat, Belinda’s complaint asserts. By then, however, she says the value of the work had been “severely” damaged because buyers tend to pull back if there’s a dispute over who has the right to sell. In addition to accusing her father of using the press to publicize his litigation, Belinda accuses Hubert in the complaint of being a “wife-beater.” The New York Post quoted Hubert’s late wife as making a similar charge, which Hubert denied. “I’m not accepting the fact that I did anything like that to her,” he said, according to the article. But Belinda notes that her parents were separated for 29 years before Dolores’ death in 2016. “Indeed, his abuse of Dolores was so great that she went out of her way to ensure that he never reaped the benefit of having been married to her,” the complaint states. In addition to suing her father, Belinda’s lawsuit takes aim at her sister, Melissa, for making allegedly false statements about Hubert’s rights to the Basquiat. Crichton is described in the complaint as the billionaire CEO as Hitchwood Capital. “Hubert’s conduct is largely explained by the fact that he is the epitome of the child with rich parents who suddenly wakes up on third base and foolishly believes that he has hit a triple,” the complaint says. Andrew Celli, who represented Neumann in the May lawsuit against Sotheby’s, declined to comment on the suit, as did attorney Burstein and representatives for Sotheby’s. Celli named Belinda and her mother’s estate as defendants in a first amended complaint dated May 25. Belinda is also represented by lawyers at Greenfield Stein & Senior. Her complaint alleges one count of tortious interference and another count of prima facie tort.